minimalism of its interiors. 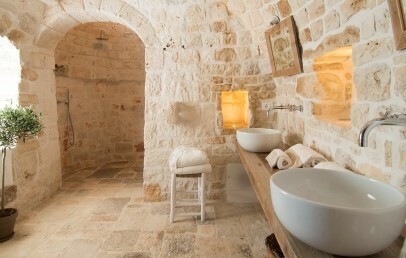 We suggest Nina Trulli Resort to the lovers of silence and genuine home-cooking. 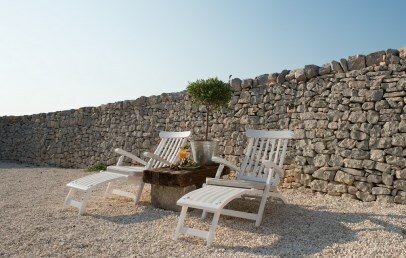 Tortorella, one of the “one hundred hamlets” for which Monopoli is famous, is home to the Nina Trulli Resort, an appealing country hotel set against the typical rural backdrop of the Valle d’Itria. Just 5 km from the sea, its position allows guests to reach easily the main tourist attractions of the area such as Alberobello, Castellana Grotte, Ostuni, Conversano, Brindisi and Lecce. 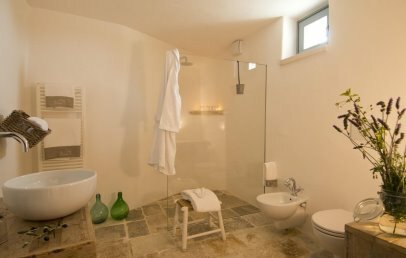 Renovated with great skill and respect, the Masseria San Francesco has become a residence of great charm without losing the peacefulness which has always marked this small hamlet of trulli, at one time a country monastery. 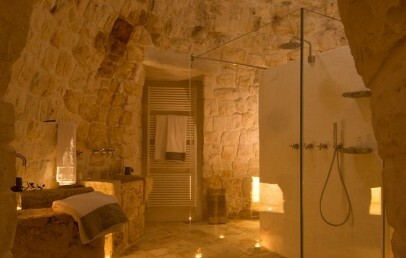 Nina Trulli Resort is in fact a small stone village, set in the typical countryside of Puglia and, as witness to its still very vibrant rural vocation, it is set in a vineyard stretching in ordered rows to the horizon, while the orchard and fruit trees offer the genuine products of a rich land. In the shade of an ancient oak tree, the pool offers an opportunity for cool relaxation. 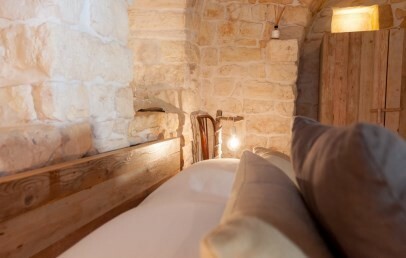 All different one from the other, the 6 rooms of Nina Trulli Resort have been fashioned inside the trulli and the old stable. Of their original structure they have preserved materials and atmosphere, producing original simplicity based on wooden furnishings, natural materials and some antique pieces. 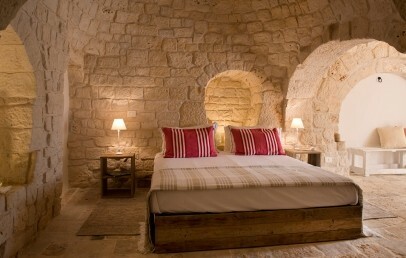 The rooms are large and well-lit, equipped with all modern comforts. The Restaurant Nina 1730 brings to the table the simple luxury of a slow, well-balanced cuisine; guests will be pleasantly surprised by the delicious local product, the authentic tastes and flavours of the Puglia countryside and a wine list going well beyond regional borders. To start the day well, breakfast offers farm-fresh fruit, salami and cheeses produced locally and the never-failing ‘chef’s specials’. For lunch guests can order a light lunch, while dinner is based on a menu of 4 courses, which varies from day to day (guests may opt to pick just some dishes and ask for small variations, with prior notification to the staff). Guests can use the Wi-Fi connection and have free access to the parking area and common areas of the premises, such as pool, equipped solarium, orchards and vineyard. Available with payment of a supplement: vehicle rental with driver, massages and wellness treatments in your room, show cooking, cooking class, fancy picnic and wine tasting. 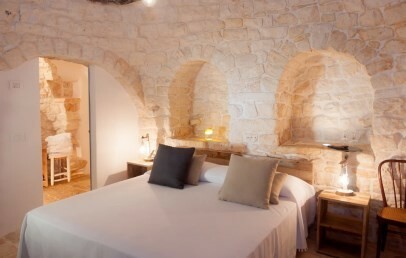 Large and luminous, the suites have a private patio, access to the terrace and the trulli and a view over the vineyard/garden. Of their original structure they have preserved materials and atmosphere, producing original simplicity based on wooden furnishings, natural materials and some antique pieces. 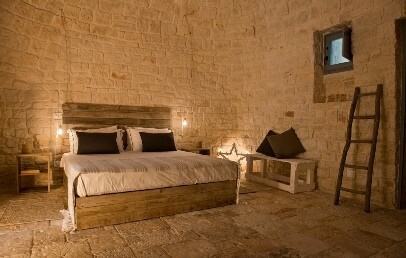 Room in trullo with wooden beams, private garden with sunbeds and the typical dry stonewall all around. 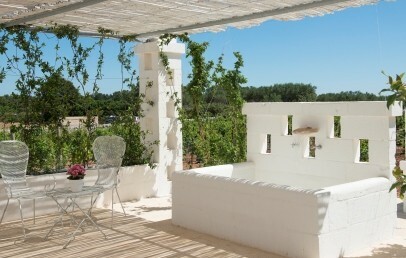 It has access to the terrace on the trulli. 5% reduction for stays of minimum 7 nights! 10% reduction for stays from April 12th to May 31st! Maximum 1 infant up to 2 y.o. free in its parents' bed. The cot (if needed) for the first child 0-2 y.o. costs € 10/day and is to be paid on the spot. For the second child a mandatory extra of € 10/day is to be paid on the spot. The second cot is to be requested upon confirmation and its availability is to be confirmed. 1 infant up to 2 y.o. free in its parents' bed. The cot (if needed) costs € 10/day (availability to be confirmed).